This solid wood heirloom gun cabinet handsomely displays six of your favorite rifles or shotguns. It is just the right size for someone not needing a large gun capacity in a cabinet. At just 27" wide, it will fit nicely into a study or small space. 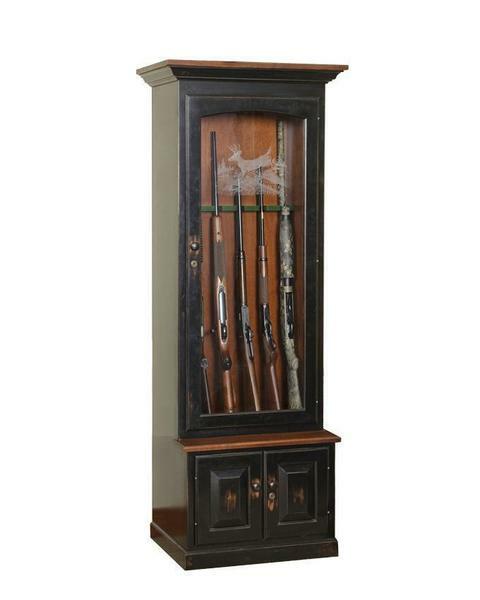 Many choose to add a gun cabinet as part of their office furniture. Handcrafted by talented Amish craftsmen and made from your choice of premium North American hardwoods. A variety of finish options are also available. We offer custom staining to match your gun cabinet to existing furniture or we will send out a variety of samples to see if we can find a close match. We are proud to sell American made furniture and our customer's are proud to purchase it. Please call one of our friendly sales representatives with questions or ordering assistance. They are happy to help in anyway that they can. Please see the quick specs below for dimensions and other standard features on this Amish handcrafted gun cabinet. Overall Width (Including Top Molding): 27"
Interior Height (Gun Cabinet space): 52"
Maximum Gun Length is 52"
Quality Takes Time – Typical Build Time for This Piece is 12 to 14 weeks. Great company, quality product, built on time.